Sophie Turner, all set to return as Sansa Stark in Game Of Thrones' season finale, is also looking forward to a wedding. When, we don't know but she just spilled some details on US TV show Access recently. 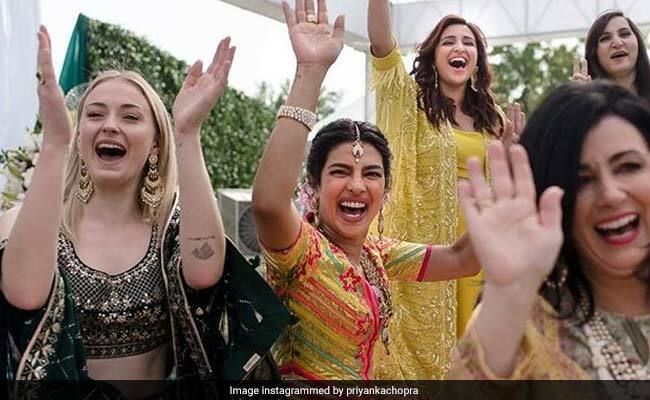 Sophie was asked if her wedding to Joe Jonas will be as filmy as that of Priyanka Chopra and Nick Jonas' blockbuster three-day-shaadi and she said not really. And Sophie has an explanation why not: "No dance numbers because like the thing is you know Priyanka's family is in the entertainment industry and can dance and sing and Joe's family obviously can and my family cannot. Like my brother's a doctor, my other brother's a lawyer. So..."
Sophie even broke into an impromptu gig of sorts when asked about the functions at Priyanka's wedding. Sophie said that's the only step she remembers - she sort of did the hook step of Gallan Goodiyan and said: "This is all I remember... there was a lot of it." Sophie's Game Of Thrones co-star Maisie Williams, who was also on the show, joined her too! About her own wedding, Sophie Turner said it will be a mix of English and American traditions: "We thought it would be fun to kind of entertain the fact that there's an English side and American side and we should have a bit of healthy competition." Sophie Turner got engaged to Joe Jonas in October 2017. She also stars in the Jonas Brothers' comeback single Sucker, which also features Priyanka Chopra. Meanwhile, the season finale of Game Of Thrones begins on April 14.